Looking in remarkably good shape for a contractor’s vehicle is this ex Sheffield United Tours AEC Regal III – chassis number 0962200, with a C32F body by Windover. 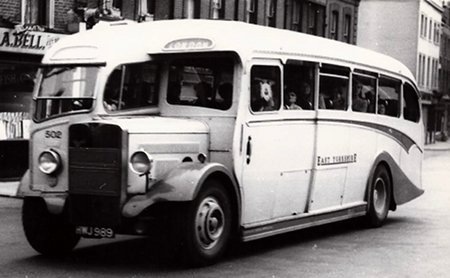 It entered service in 1949, was sold on to Davies, Tredegar (via dealer) about July 1958, thence (via dealer) to Townson as shown, who operated it for about two years before selling on again. What a great combination was the AEC Regal III/Windover half cab. SUT had a goodly number of these vehicles on both the medium weight 068 as well as the heavyweight 0962 version of the Regal III. There were also a fair number of Duples – which were disposed of rather quickly/earlier than the Windovers. I’m too young (oh yes I am) to remember these half-cab Windovers in service. Apparently they were known for two things: (i) They were superbly finished – "even better than Duple" but (ii) the structure was suspect (with the common post-war use of "green" wood for the frames). 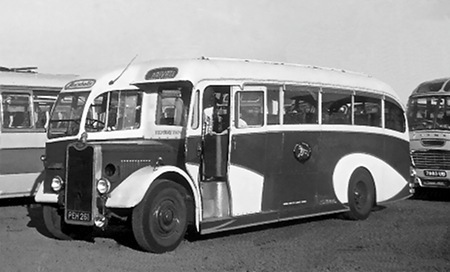 These bodies were very popular with the BET companies who did substantial coach work (especially in the north). It was rare, however, for them to reach a ten year life-span with their first operator. I don’t recall seeing – and certainly don’t have any "bought" views of – these vehicles in reality, though I have seen them in model form. The models seem to capture the reality very well. 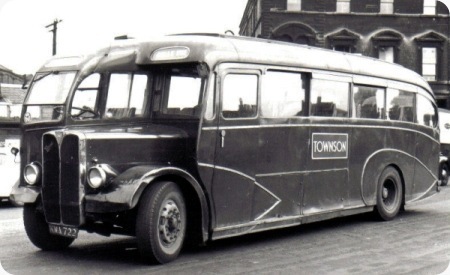 I have vague memories of Townson vehicles in the late 1950’s and early 1960’s, when they, like Monk of Warrington and, of course, Wimpey, used old buses and coaches as staff transport. Bizarrely, for a firm whose products (from the point of view of finish) were so highly regarded – and eminently suitable as touring coaches – they disappeared after the Royal Tiger/Regal IV era. I am not aware that they even got as far as bodying a Tiger Cub or Reliance. Doubly strange since they had been in business since 1766. Their factory was just down the road from Duple’s in north London. Davids point about BET companies in the North. 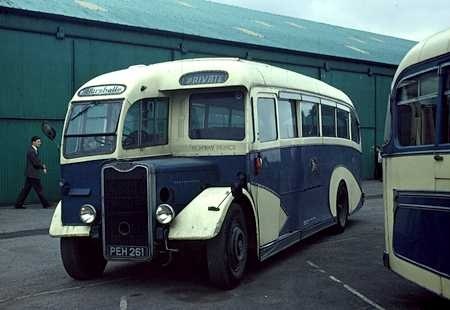 As far as I know Ribble had some Windover’s, and although I’ve only seen pictures of them, Northern General had 8 on Guy Arab chassis fitted with Meadows engines, but they were later replaced with AEC A173 7.7 units. They were new in 1949 and by Northerns standards they had a relatively short life of only 8 years, they were gone by 1957. I’ve always thought that this body from Windovers came a very close second to the Duple A type for it’s pleasing lines and symmetry. They got the look of this just right and it’s very easy on the eye compared to others of the time, some of which had the vertical framing pointing up in all directions, like badly arranged flowers in a vase! There’s no wonder that the BET group went for them in a big way although I had heard about the problems mentioned by David O, I understand that the roof and domes were notorious for leaking water into the saloon. Do any of the Sheffield contributors remember various SUT AEC Regal coaches operating on hire(?) to Sheffield Transport during the late 1950s? I particularly remember the fully fronted LWE registered batch operating on the 82 between Ecclesall and Middlewood with an honesty box just inside the entrance. I think this was more a result of a crew shortage rather than serviceable vehicles. Re S.U.T. coaches operating on hire to S.T.D. I can also remember travelling on them on the 82. Also I remember that Batchelors hired a coach to "market" their products. They gave out free samples of their products! I recall that this was my first introduction to green pea soup. I’ve just been through the fleet history to make sure of my gut reaction, and Ribble never operated any vehicles with Windover bodywork. Some of North Western’s Huntingdon bodied Bristol L5Gs were "cascaded" to Melba Motors in 1958-61 and repainted in that subsidiary’s blue and cream livery. EFE have produced a 1/76 scale model of one of these Melba machines, depicted after sale to British Railways. For customers wanting bodywork for underfloor engined chassis (but who considered the Kingsway too avant garde) Windover also offered the Queensway model with more "traditional" lines. Unfortunately it somehow resembled an electric-powered delivery van or milk float and its only major customer was Yorkshire Woollen District. Incidentally, while it’s a well-known fact that the Kingsway body was named after the location of the BET Group’s head office (and the Queensway merely mimicked the nomenclature of the Kingsway), nobody has ever been able to tell me why the front-engined body was called the Huntingdon. Any suggestions? Yorkshire Woollen had Windover coaches both half cab and a late batch of Royal Tigers. Incidentally when I got married the Rolls Royce wedding car had a Windover body c.1935. I don’t recall hearing about SUT coaches on hire to Sheffield Transport Department before, but it certainly happened that Joint Committee buses went to work for SUT on occasion. Under the Sheffield heading of the ‘Vehicle Developments’ column, in Buses Illustrated issue no. 56 for November 1959, there’s a report that " …. Leyland Tiger PS1’s 1193-5, 1201/2 (KWE 93-5, KWE 1/2), which have Weymann bodes, were on loan to Sheffield United Tours in July." Interestingly, in the same issue under the Sheffield United Tours heading, it mentions that the operator actually hired back AEC Regal III’s, 186/90 (LWE886/90) from the dealer to whom they’d already been sold, in order to assist with summer peak traffic. It must have been a busy summer at Charlotte Road! I did not know that Windover were in business as far back as 1766, but the firm certainly opened a factory in my nearby town of Huntingdon in 1796, building high quality carriages and, later, motor car bodywork for prestigious marques such as Rolls Royce and Bentley. The business moved to Colindale in north west London in 1924.The firm made aircraft components during WW2 and expanded into commercial vehicle bodywork postwar. 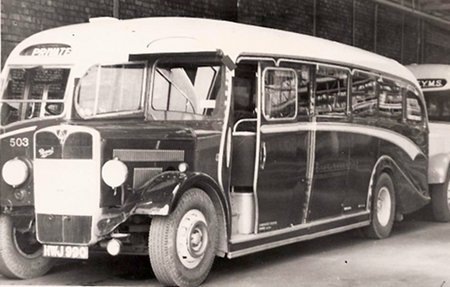 In 1956 the company was taken over by Henleys and all coachbuilding activity ceased. Just a follow up to the story on SUT Regals which may be of interest, EYMS purchased three of SUT 1947 Regal/Duple coaches in 6/48 becoming 502-504 HWJ 989/990/992 these lasted with EYMS until 9/60 and then all three passed to Lloyds of Nuneaton. At first they were operated in SUT livery with EY fleet names before being repainted into EY’s indigo blue & primrose, I believe Yorkshire Traction also bought some from this batch as well. The Windover Kingsway did make it into the lightweight era, just. Two AEC Reliances appeared at the 1954 Commercial Motor Show with C41R bodies. They were MBE 611 for Hudson, Horncastle and RUP 843 for Gillett, Quarrington Hill. 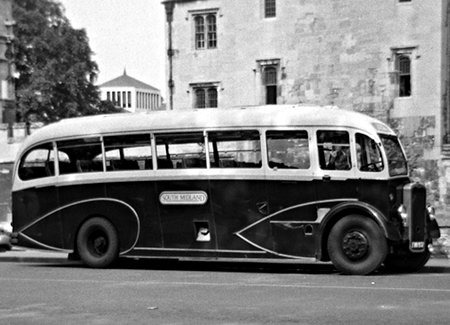 Biss Bros, Bishops Stortford also had four Kingsway bodied Foden PVRF6, NJH 847 of 1951, and NUR 197, NUR 198 and ORO 107 of 1952. A further BET customer for the Queensway was Red Line, W10, with OLX 1-3 on AEC Regal IV chassis. A picture of one appears in Ian Allan abc of Buses and Coaches, published around 1956, although wrongly described as a Reliance. At least the first and last were rebodied with Plaxton Panorama bodies, and photos of them in this form can be seen on Flickr. The SUT AEC Regals were on hire to STD, I think in 1956, they also worked on the 110 Parson Cross via Owlerton service at peak times. A colleague, the late Mike Gillott, became an auxiliary conductor, supervising the half cab forward entrance. He regularly travelled to and from his workplace on 82 Ecclesall duties, assisting the regular driver. An acute staff shortage WAS the reason for the hiring. Thank you for the information Keith, I recalled the honesty box and hence no normal conductor to take fares but I couldn’t remember how the manual door was operated. Roger answers the Huntingdon question. Trent had some Regal IIIs – one I believe now owned by Steve Morris – and Timpsons had Regal IV/Kingsways (such as LUW 454 which worked on hire to SUT, complete with shield.) Thanks to Trevor Weckert for latter information. SUT was the winners of the 1st International coach rally in Montreux in 1949 with KWA 724, a Regal III with Huntingdon coachwork. they repeated this success the following year with LWE 892, one of the full fronted Regal III’s. Incidentally, the entire batch of full fronted Regal III’s were originally ordered as 7’6" (6821A)wide but when Ben Goodfellow, the new GM took over he modified the order to that of LWE 885-890 to remain as ordered but LWE 891-896 to the new 8′ wide specification (9621E). Regarding Batchelors Demonstrators..MWJ 197/NWB 198/9/203/4/6/8/OWA 210/111/OWB 215 were all used for this purpose. Just found your website and photo (KWS 722) as I was looking for photo’s of Townson buses used as workmens transport. This bus was used daily on the Bolton to Manchester Piccadilly Station run when Townsons had the main contrct for the rebuilding of the station in 1964 /6. I worked for Townsons on that site and travelled on this bus daily during my employment there. I note that in the first comment the contributor says this was sold on after Townson’s use, but my recollection differs. In 1966 the transmission shaft became increasingly "clunky" and eventually it crashed up through the floor of the bus on a journey home to Bolton,in 1966, though I was not present at that time. I was told that the bus was eventually scrapped, by the person who regularly drove the buses for Wm. Townson. By the way, the door was operated by a large vertical lever on the inside which pulled inwards and backwards to operate the sliding mech. Hope this helps. The photo is taken outside the old London Road station Manchester, before it was renamed Piccadilly Station. This coach first appeared on the do you know page and is from the Paul Haywood collection information supplied by John Kaye provided the history regarding this very nice half canopy Guy Arab III photographed at Blackpool in 1963. This coach was bought new by Scraggs of Cheadle which is halfway between Stoke-on-Trent and Uttoxeter, Staffordshire. They did not keep it very long as it was bought the following year 1952 by Ripponden & District Motors, Ripponden is a small village about five or six miles to the west of Halifax, Yorkshire. There main business was light haulage in the Yorkshire/Lancashire area they had two nick names from people who new them, ‘Rippi Dicks’ and ‘Rush and Dash’ but if you were to ask an employee where they worked the answer they would always come back with would be ‘down district’. Hebble Motors of Halifax bought out Ripponden & District Motors coach excursions in 1957 and left them to concentrate wholly on there haulage business. Four years before being taken over they sold the Guy on to Marshalls of Bradford. If you look carefully you can just see a name plate on the near side just below the saloon window it reads ‘Highway Princess’ did Marshalls name it or did it always have a name. If you know please leave a comment. This picture brought back happy memories! 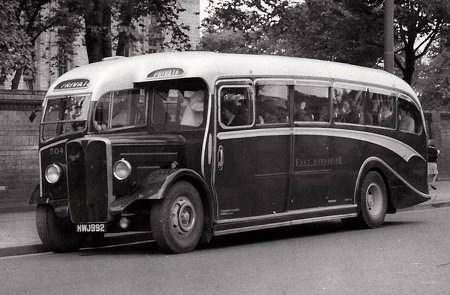 A group of Students from Bradford Grammar School hired this coach from Marshalls in 1959 for a trip to Merseyside to see the first production Atlantean, and also take in Birkenhead Corporation buses. It certainly carried the Highway Princess name at that time. As an aside, its was interesting to note that at the same time as Wallasey were commissioning the Atlantean, Birkenhead had just put a batch of PD2/40’s with exposed radiators into service. Examples of both types (FHF 451 from Wallasey and FBG 910 from Birkenhead) have made it into preservation. I though you might like to attach this colour view of the Marshall’s Guy/Windover coach to the existing article. Compared with the Blackpool shot, it has acquired a rather less stylish pair of wing mirrors and lost its chieftain, but is otherwise unchanged. The picture was taken on 25/8/68 by which time the vehicle was in the ownership of Kirby’s, the well known dealer at Anston (?or Dinnington) near Sheffield. I wonder whether it found a new owner, or was simply at a staging post on its way to Barnsley or similar. Rather a nice colour picture of it. It still appears to be sporting the Marshall fleetname on the side panel as seen in the B&W shot. I well remember this vehicle whilst I was at school in the 60s as it regularly passed the bottom of our street. It normally seemed to live outside the owners home in Kensington Street Bradford, though as Marshalls owned 2 coaches, the other one must have lived elsewhere. Marshall’s acquired 3 vehicles when Ripponden & District stopped running coaches in 1957, these being a one and a half decker Commer with an SME registration, the AEC Regal IV with Whitson body which did not go to Hebble who took over R & Ds other vehicles and PEH 261. It may be that Marshalls were agents for R & D in Bradford as they had an office in Swaine Street, and that the vehicles were bought to continue in business, as these were the first vehicles owned as far as I am aware. The vehicles retained R & D colours though I seem to remember PEH at on time being all over cream with blue flash. The fleet name on the side is not actually the company’s name but a leaping tiger which was used on the side of R & Ds coaches and presumably was never painted over. Although not quite the same, it was similar to the tiger leaping through the hoop on Ellen Smiths coaches. It’s pleasing to note that the original purchaser of this coach, Scraggs, is still very much in business, operating local bus services in the Stoke area. A blast from the past ! This thread started before I became aware of the OBP website and I missed this one. I well remember this vehicle and Marshalls who did quite a lot of work in my local area of Bradford. I was on the Bradford Grammar School trip mentioned by David Bate who I remember from School. I also remember being on a male only party up into the Dales which used this vehicle. There certainly were the traditional crates of ale aboard – the only problem as I recall being that the coach had been booked the following day for a Mother’s Union outing from my local Church. Enough said. I’m only a year late in spotting Alan’s 24.11.12 post and mention of Kirkby’s (with two Ks). Kirkby’s were a coach dealership at North Anston on the north side of the A57 between Sheffield and Worksop – which is just south of Dinnington. They were also an operator in their own right with O licences for two operations – Kirkby’s of Harthill (near Anston) – with a rich blue livery (similar to Sammie’s) – and J O Andrew of Sheffield – with an attractive two tone green livery. History has made all of these strands into important players. i) Kirkby’s was the first of several new owners (after the family) of Plaxtons. In yet another case of reverse take-over, they took on the more famous name (Plaxton) and the current Anston Plaxton site is indeed the original Kirkby site. [Remember that East Lancs/Darwen bought Optare in recent years but "reversed" to become known as Optare. Same sort of thing.] Kirkby’s, at the time, were also a major Vauhall/Bedford dealership in the Rotherham and Worksop areas. Oooo – it’s doin’ me ‘ead in! Sorry, Stephen….. [well I’m not really]. Just came across this photo, the original owners also ran a fleet of lorries, my Dad drove for them in the early 60’s. The company went out of business late 60’s and there is no connection with Scraggs of Bucknall, Stoke on Trent as reported on here!